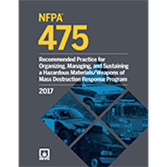 Prepare communities for hazardous materials response with a solid foundation based on NFPA 475: Recommended Practice for Organizing, Managing, and Sustaining a Hazardous Materials/Weapons of Mass Destruction Response Program. In industrial and technology based countries, hazardous materials are a significant source of concern due to their potential risk to people and the environment. Created through industry consensus and by the leading experts in the field, all-new NFPA 475: Recommended Practice for Organizing, Managing, and Sustaining a Hazardous Materials/Weapons of Mass Destruction Response Program assists communities and public and private sector agencies and organizations with developing a comprehensive and effective way to mitigate risks. Unique in the field, NFPA 475 provides the minimum criteria for organizing, managing, and sustaining a Hazardous Material Response Program (HMRP) based on the authority having jurisdiction's (AHJs) function and assessed level of risk. Organize, manage, and sustain an HMRP to reduce or mitigate hazardous materials/WMD risks with the guidance in NFPA 475. 4.5 Consensus Standards by Organization. 5.3 Identifying Hazardous Materials/WMD Within an Organization/Jurisdiction. 5.4 Analyzing the Consequences of a Release. 6.4 Emergency Operations Plan (EOP). 6.5 Standard Operating Procedure (SOP)/Standard Operating Guideline (SOG) Planning Components. 6.9 Information and Intelligence Sharing. 7.6 National Incident Management System (NIMS) and Resource Management. 8.4 Resource Typing and Specialty Personnel or Allied Professionals. 9.3 Levels of Hazardous Materials Training. 9.5 Annual Competencies and Refresher Training. 9.9 Training Delivery Methodologies and Models. 9.11 Selection and Competence of Instructors. 9.12 Training and Exercise Safety. 13.4 Coordination with Other Response Entities. 13.5 Local and State Planning Group Relationships.